The japanese director Hayao Miyazaki has produced some of the world’s best animated films. His “My Neighbor Totoro” is one of my favorite kids’ films. It came out in 1988, but didn’t really make a showing in the US until much later. Around 1990 a friend of mine who is an Anime fanatic introduced me to Miyazaki’s work. We would watch the movies, and someone would read the text translation as the movie progressed. How primitive! One of the great things I noticed about Totoro in that setting was that it was universal. Pastoral beauty, kids being kids. It needed no translation. Disney has finally decided that Miyazaki movies have a market in the US and has produced some decent dubbed versions of his movies on DVD for the US market. Now that I have a son of my own I want him to grow up loving Miyazaki’s work too. So for his second Christmas I gave him My Neighbor Totoro, and Kiki’s Delivery Service on DVD. 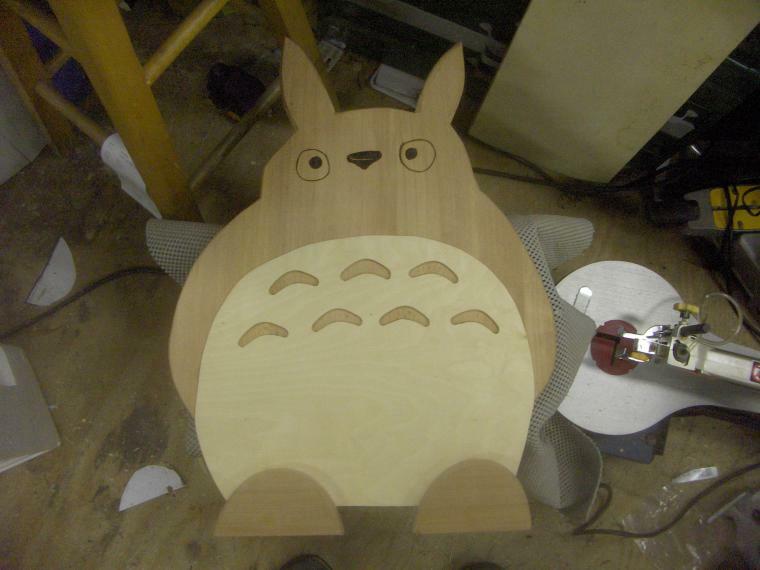 I also decided to make him a wooden step stool that looked like Totoro. So I did a sketch. That’s the problem with a lot of the projects I do. I’ll do one or two quick sketches, and then I’m off slavishly producing that exact thing in wood/metal. Not exactly going with the flow and following the inspirations provided by materials at hand, etc. I did the sketch. I went down to shipping and receiving at work and snagged some cardboard boxes. I blew the sketch up on the photocopier and used that as a pattern to cut out a full-sized mock up. Doing a mock up is good. It’s something you can do in 30 mins with office tape and scissors that’ll warn you about things that you wouldn’t otherwise discover until 2/3 of the way though the project. I decided on an overall scale for the project, and I was off to the races. 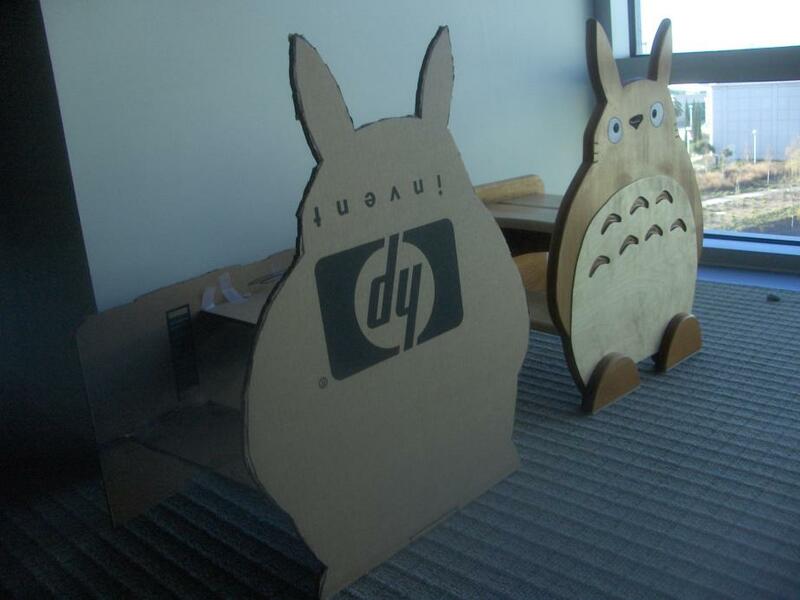 I took the cardboard Totoro home. I sort of hid it by tucking it vertically under the bench, but the next time my son came out to the shop he went straight to it. I guess even the clutter and chaos of my shop has enough pattern to it that he was able to pick out the “new” object in a flash. He went right over and grabbed it. He was 20 months old at this point. “Whaz that?” He said excitedly. He put his arms around Totoro’s neck. “Eye. ‘nother eye!” he said with his face only an inches away from Totoro’s eyes. “Ear. ‘nother ear” he said grabbing the ears. “Owl?” Apparently Totoro was an owl. I hadn’t thought about it before, but he does rather look like an owl. At this point, he’d never seen the movie. He had no idea what Totoro was, but I could tell by his excited reaction that the Totoro project was going to be a success. I wanted to use natural wood colors for the various bits of Totoro. I don’t know why I do this except that I rather like wood’s natural beauty, and many of my staining projects seem to come out somewhat blotchy. So I went to the Minton’s lumber to get some darker looking wood. I settled on Alma Rose. I have no idea what kind of wood that is, but it was brownish, with even grain, it wasn’t heavy, and it was comparatively cheap. (Less then $2 a board foot) So I was all over it. I biscuited it together, and low and behold the joints weren’t that flat. So I spent a good chunk of time hand planing and then random orbit sanding with a 60 grit disc to get it flat. I had originally thought I’d do his belly using some spare white formica that I had left over from a counter top. Then I had this “good” idea. 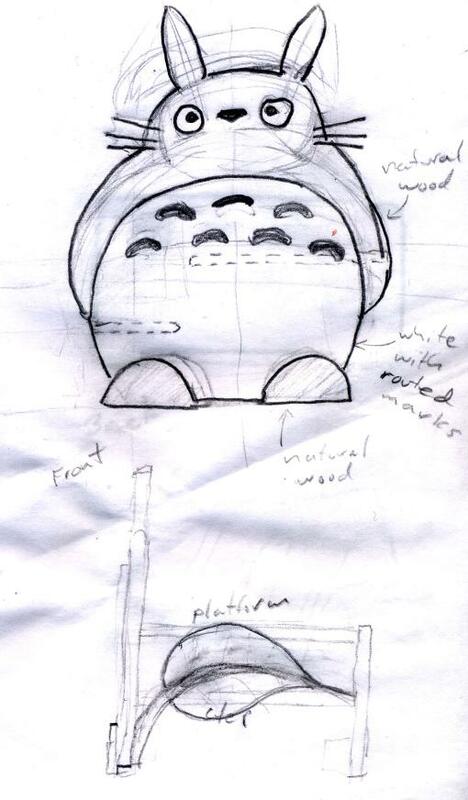 Instead of using formica I could put a light wood veneer on, it would look more natural, and I’d still be able to route through to produce the darker chevrons on Totoro’s chest. I got some veneer and some veneer glue, and I stuck it on. Now it is at this point dear reader that I noticed that the clamping force recommended in fine print on the glue’s label was something like 200 lbs per square inch! Now that was going to be something like 14 TONS of clamping force. I started to get a bit worried. 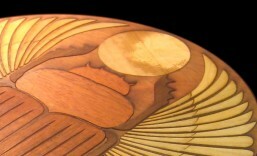 I noticed that the piece’s shape made it hard for me to get clamps to reach many of the edges of the veneer. I worried more. I put the board on the shop floor with a board over it, and then piled layer after layer of concrete block on top of that. Still probably had less then half a ton total on the board. Not good. The next day I unpiled the stack only to discover that the veneer had rippled horribly. I had to sand it all away again using a 60 grit pad. Tediously back to square one. So I thought I’d glue down thicker wood. I had some nice figured maple and I thought if I resawed it into 3/16 boards it would look really nice. However I didn’t have a resaw blade, and I quickly discovered that resawing figured maple is a lot harder then just sawing thin strips of wood off a pine 2×4. The blade wandered and pretty much destroyed the piece of wood I was trying to resaw. The smell of burnt wood, the destruction of one of my nice chunks of maple. All the hallmarks of a “learning experience.” What the heck was I going to do? Time to go back to the wood store. I finally decided to go with some very thin plywood. It looked nice, and glued down without a ripple. Not as nice as solid wood, but hey Christmas was coming and I was working with a deadline. His belly was on. So I traced and cut out his outline. I cut the outline on the bandsaw. Now he was starting to look like like something! I used the belt sander to round the various contours, and then a drum sander chucked in the drill to round some of the harder to reach inner corner edges. Then there was lots and lots of hand sanding to refine what I’d done with the belt sander. My son wasn’t in the dark about this project. If I’d been spending this much time out in the shop without him getting to see what was up, he would probably have exploded. So he came and checked out how things were progressing. 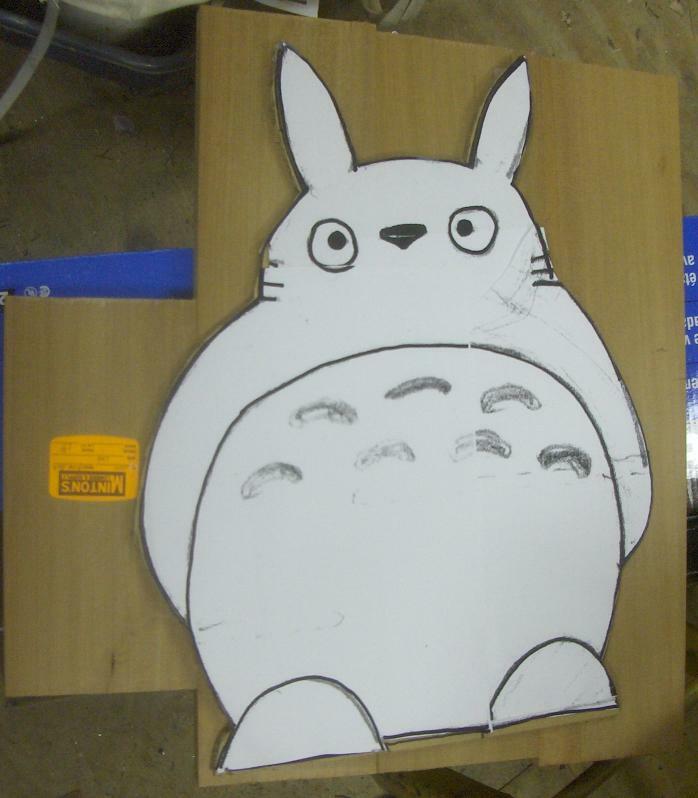 So then I made a router template to cut the chevrons on Totoro’s chest. 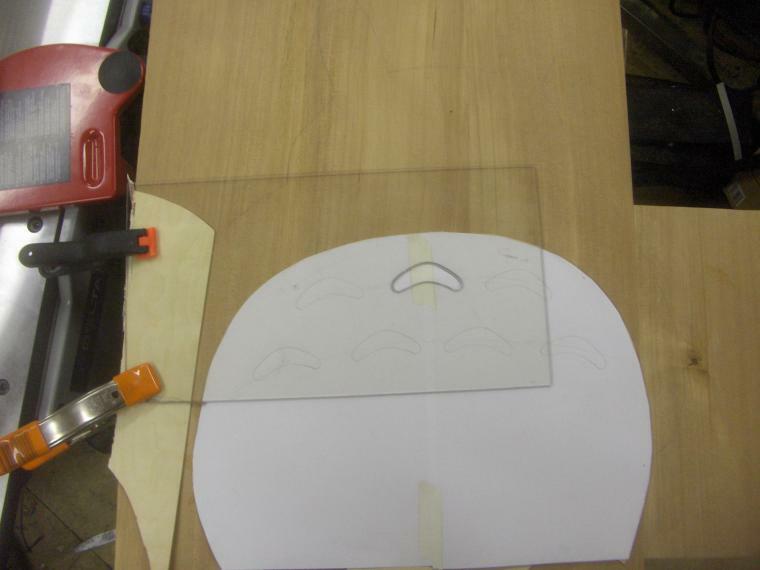 I did a sketch on paper, cut the outline onto some 1/8″ acrylic sheet, and drilled/filed the shape out. Then I’d clamp that into position for each of the chevrons and routed away. I used a ball end bit, and would do a “once around the outside,” and then a series of evenly space vertical passes to route out the interior. I didn’t want to have to finish the bottoms of those things and I figured that sort of pattern would provide an interesting look that wouldn’t need much touching up. 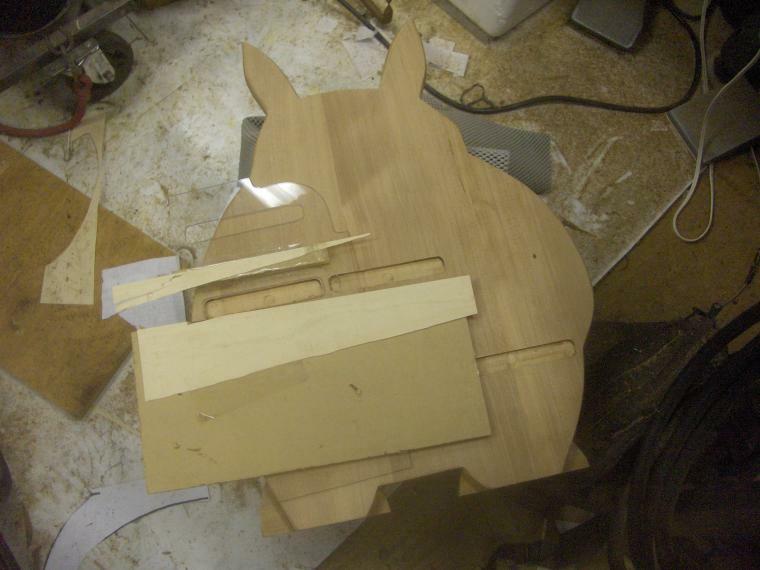 I also used a router template to route the recesses in the back of Totoro that would hold the treads of the step stool. That exact pattern took quite a bit of trial and error filing because the treads were somewhat cupped and I wanted the holes to match the boards rather closely. I also did a routing trick on the feet to make it so that they overlapped the bottom of the belly plywood. That way there was no visible edge just above the feet. 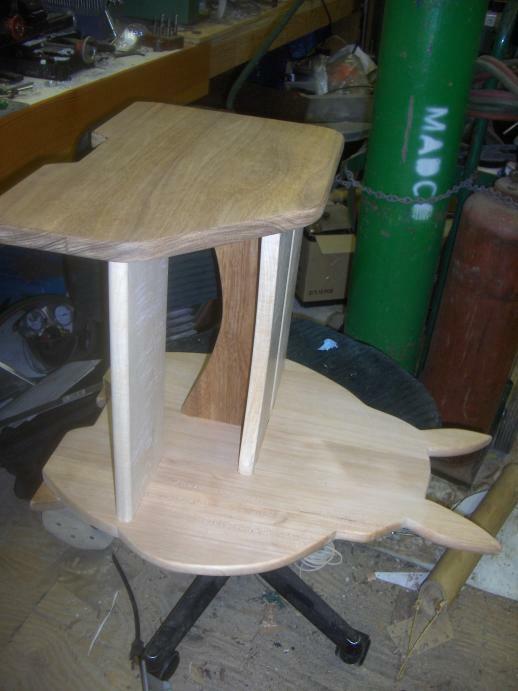 At this point I also needed to work on the other side of the stool. I didn’t quite have enough Alma Rose left to do it out of that, so it was back to the wood store for the third time. They didn’t have a nice Alma Rose board, so I opted for some Australian Blackwood that was a similar hue, and quite a bit denser. 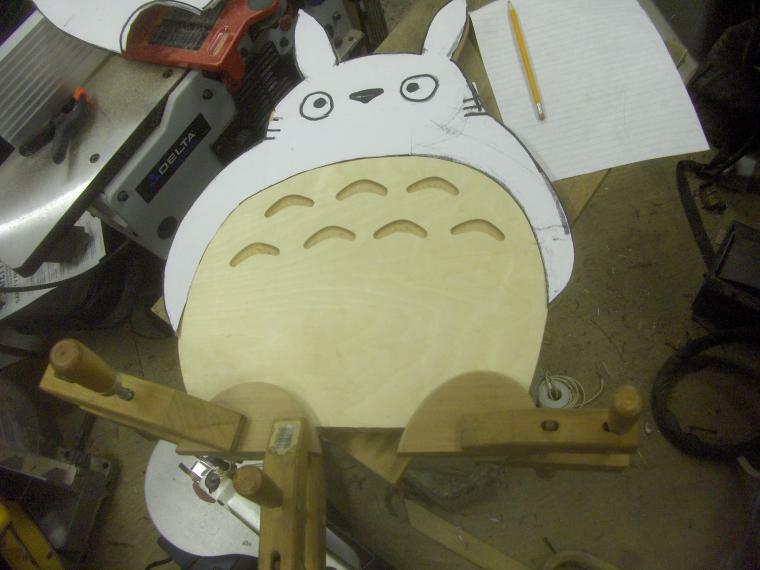 That had the advantage of counter balancing the bigger Totoro side of the bench. I cut the treads from more figured maple that I’d snagged by picking carefully through the boards at HomeDepot. It’s amazing what you can find there if you keep an eye out. Don’t tell anyone! I cut a nice curve out of the upper tread, and echoed it in the piece I put underneath to provide more diagonal reinforcement. So I routed the Totoro side. Then I took careful measurements and routed the hole for the treads on the other piece. I SHOULD have taken a piece of paper and a pencil and made rubbing of the routed recesses to make the pattern on the other side. What did I actually do? I took some careful measurements and laid out the other side. After routing those holes I tried putting it all together only to discover that the bottom tread was off by exactly 1/2″ back to front. Horror! I was forced to route another opening, and make a 1/2″ curved patch to put into the extra gaping hole on that side. I don’t know where that 1/2″ went, but it was so big, and so exactly 1/2″ I can only assume I screwed up my measurement somewhere. So some time was lost making the patch, but the end result isn’t that bad looking. It’s not easy to pick out at a glance. An imperfection to show the hand of the maker and placate the gods. So I used a wood burning pencil to burn Totoro’s face on. Always a bit hairy because with a wood burning pencil there’s no erase. (Well short of gouging out a fair amount of wood.) So that was a bit ticklish. Thankfully I was able to follow my original sketch’s lines reasonably well, and his face came out fine. 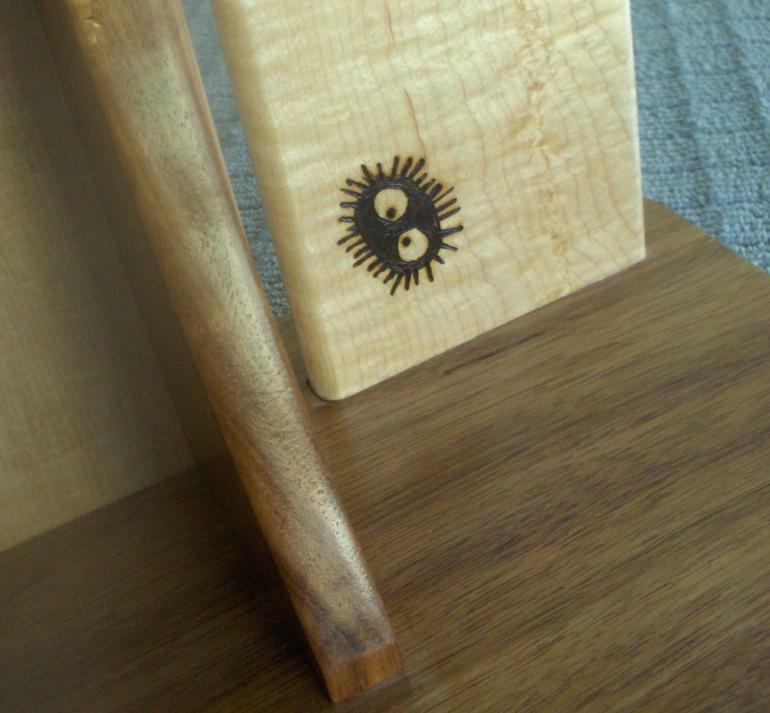 I had decided to burn on of the Soot Spirits on the other side of the stool, but then decided that such a spirit would be much more at home hiding in a dark corner on the underside of the stool. That would have been a lot easier had I done that before gluing the whole thing up. Oops. Still I managed to burn it without any big screwups. Even if it was 3 times harder because it was in a corner. He just feels safer and more comfortable down there. So then it was off to put various coats of polyurethane on the project. The hard part was that I couldn’t finish it out in the shop. It was too cold and damp and dusty to have it finish in any sort of time, and I only had a few days left before Christmas. So I put the finish on it in the house. That seemed to be going reasonably well. I had put on the last coat and was kicking back when I heard a bad sound from the other room. “Sticky … sticky… sticky…” My son was saying “sticky” over and over. I could only think of one thing is that room that was probably still sticky. A great big half-dried Totoro. Oh no! So Cheryl and I went in there. Cheryl washed off his hands while I tried to deal with the hand prints. I ended up putting on another thick coat right then and that mostly hid them, at the cost of a few drips that cleaned up with a razor blade. Ready for Christmas by a Whisker. Well Christmas came, and our son was flooded with gifts. The Totoro had been a more or less constant presence at our house for the past few weeks, so it wasn’t exactly a surprise. Still he was excited to be able to clamber all over it (finally). He used it to get on his new train table. Thank goodness it was done, or very nearly done. There were a few finishing touches that I put off until the new year. Felt pads on the feet, painting the background of his eyes white, and putting on his whiskers, but by Jan 3rd it was well and truly done. phew. Here is the original page in Internet Archive.